Do you think somebody is accessing your DCU email account without your permission? 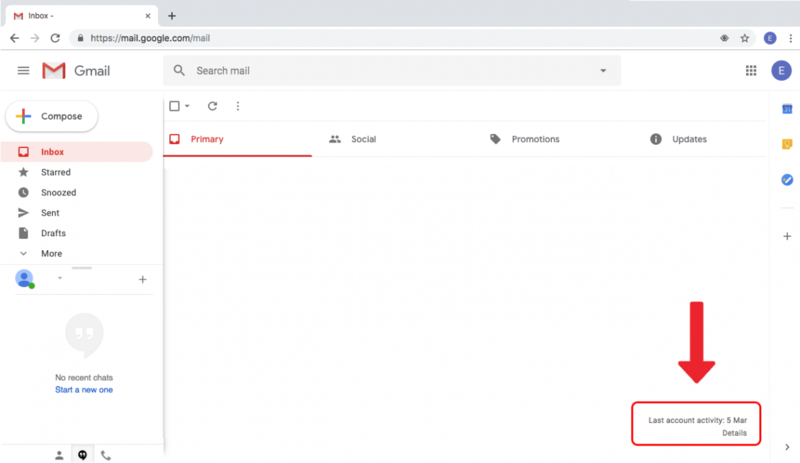 Whether you suspect someone is reading your mail or just want to double check to make sure there is no suspicious activity, there is an easy way to check. Then click the Details link, highlighted in red in the image below. By clicking on the Details Link a new window will bring up a log that displays the number of places you have logged in from — including your current session, circled in red in the image below. If something looks off, you can sign out of all sessions by clicking on the button to the left of the red arrow in the image below. This will close all active sessions on all devices. 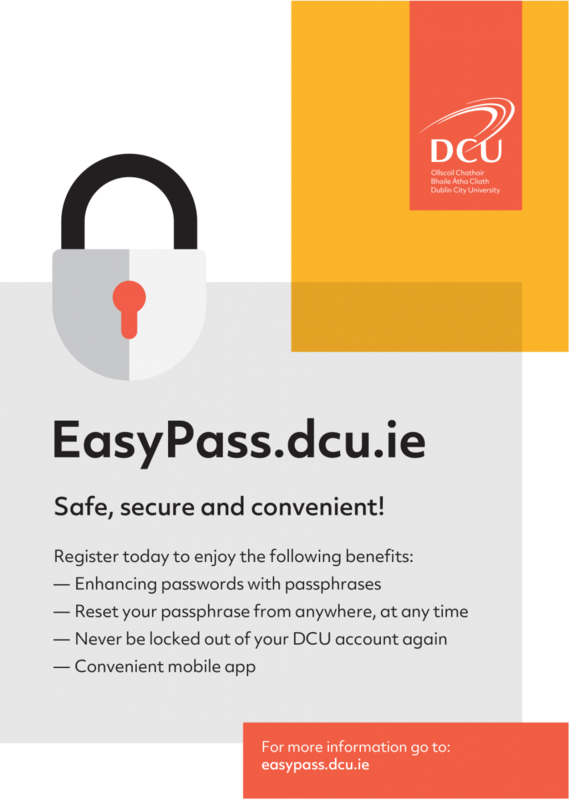 EasyPass is a safe, secure and convenient way for you to reset or change your DCU password and to unlock your DCU account independently of ISS. Log in with your DCU user name and password. Register an alternate non DCU email address. This email will be used in the process to unlock your account and to change your password. Reset your passphrase from anywhere, at any time. Never be locked out of your DCU account again. Minimum length should be at least 14 characters. Must contain both upper and lowercase characters. Must not be a palindrome. Must not contain any character more than twice consecutively. Must not have 5 consecutive characters from the username. Please visit our password information web page for more detailed advice on the creation of a new passphrase. The Cisco VPN client that you are currently using has reached the end of life and is being replaced with the new DCU Pulse VPN. All users of the existing DCU VPN service will need to install the new Pulse VPN client to ensure continued remote access to the DCU network. The new Pulse VPN is future proofed and is available to install on handheld devices such as iPads, iPhones, and Android devices. If you encounter any issues while installing the Pulse VPN client, we would ask you to submit a ticket with as many details as possible so we can assist you with the process. In light of the recent General Data Protection Regulation that came into force on the 25th May, there is an onus on us all to ensure that University and personal data is transferred and stored appropriately. It is University policy that all data on mobile devices must be encrypted and the use of USB keys to transfer or store “sensitive personal data” is prohibited. Under GDPR, “sensitive personal data” is a specific set of “special categories” that must be treated with extra security. Personal data revealing racial or ethnic origin. The processing of genetic data. ISS recommends that you use centrally provided systems and services for the storing and sharing of such data, however, we do recognise that there may be occasions where it may be necessary to use a USB key for non “sensitive personal data”, and on such occasions, the USB key must be encrypted in accordance with the Dublin City University Mobile Computing Policy. We would recommend that all staff are familiar with the DCU Data Handling Guidelines and would encourage you to visit the ISS dedicated web page on Securing University Data for more information on encryption, data storage, and data transfer. ISS is working with the University’s campus companies to ensure that encrypted USB keys will be on sale on each of the academic campuses. Information Systems Services have student support desks on all DCU campuses.